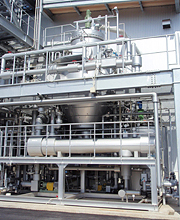 System example - Borate salt manufacturing facilities (evaporative concentration crystallization) | KATSURAGI INDUSTORY CO.,LTD.- Dryers,Drum Flakers,Concentrators,Crystllizers. These are borate salt manufacturing facilities. A decanter is used for pre-processing of a reaction liquid containing SS component. 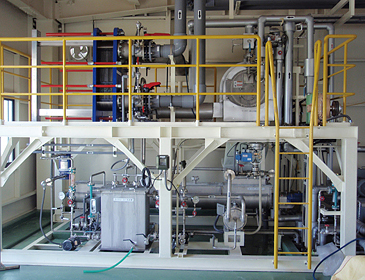 A raw material is mixed with a reaction liquid, and crystals produced by the evaporative concentration crystallizer (outside circulation DTB type) are subjected to solid-liquid separation using a centrifugal separator to extract crystals.